The Buffalo Bills are on quite the roll. After getting obliterated by his old team in Week 2’s Thursday Night Football game, Rex Ryan has rallied his Bills and they are on a four-game winning streak. Yahoo! Those wins aren’t just Ws… they’ve come against some stout squads in the Cardinals, Patriots, Rams, and 49ers. A big reason for the Bills success over the last month has been running back LeSean McCoy. On Wednesday McCoy suffered a hamstring injury during practice, and it’s obvious that this is hindering him one day later. Shady McCoy is currently the NFL’s second-leading rusher with 587 yards (Cowboys Rookie Ezekiel Elliott leads the league with 703). 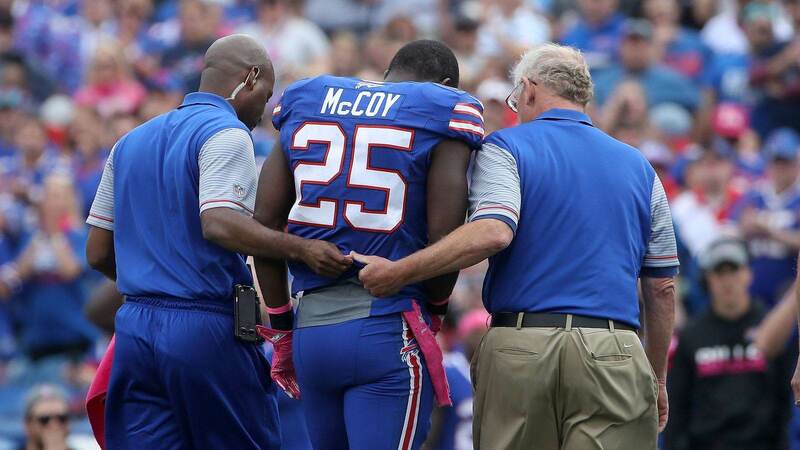 While he is known to some for being injury prone, McCoy has only missed four games since 2013. Shady’s backup Mike Gillislee is worth an add in your fantasy leagues if you’ve got the room. Buffalo is going to want to continue their run-first approach when they visit the Miami Dolphins on Sunday, and if Shady is out/weakened Gillislee could be of serious use. How worried are you about LeSean McCoy? Let us know! Comment below, Email me at RJ@RJOchoaShow.com, or Tweet to me at @RJOchoa!